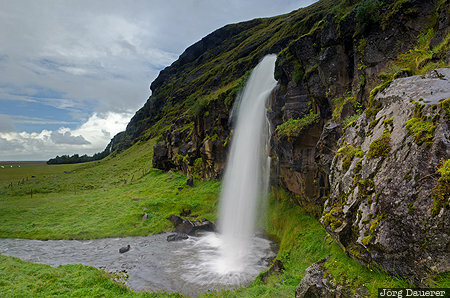 The waterfall Thordarfoss surrounded by the green landscape of southern Iceland near near Hvolsvöllur. Hvolsvöllur is in Suðurland in the south of Iceland. This photo was taken in the early afternoon on a cloudy day in August of 2013. This photo was taken with a digital camera.